My best title yet! I feel so silly every time I post one of these hair blogs, but you must understand, I get weirdly a lot of traffic when I do. So you better believe it’s going to continue. Personally, I’m pressed with how long my hair is right now. I can put it in a cute half-pony, I can put it in a full pony too. Although, not without the help of many bobby pins and headbands. Maybe I’ll be able to do milkmaid braids by the end of the summer. You can see the progression in other posts here. Oh, hi. The weather is still terrible, so I thought it’d be a good day to update you all on the length of my hair (and because so little matters in the grand scope). I know you’re all on tenterhooks! 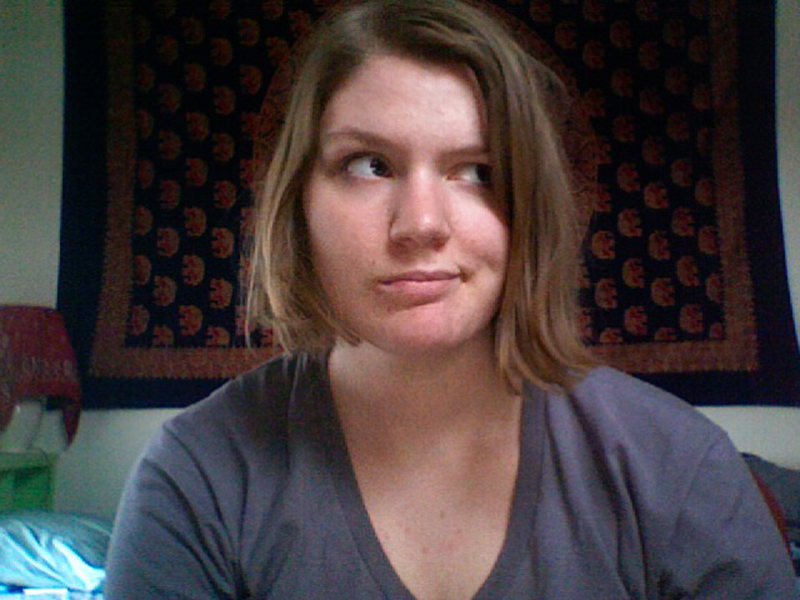 It’s safe to say I no longer have a pixie cut, and I’m back in the realm of having hair you can tuck behind your ears. For real, this hair makes me feel all kinds of cool and confident. 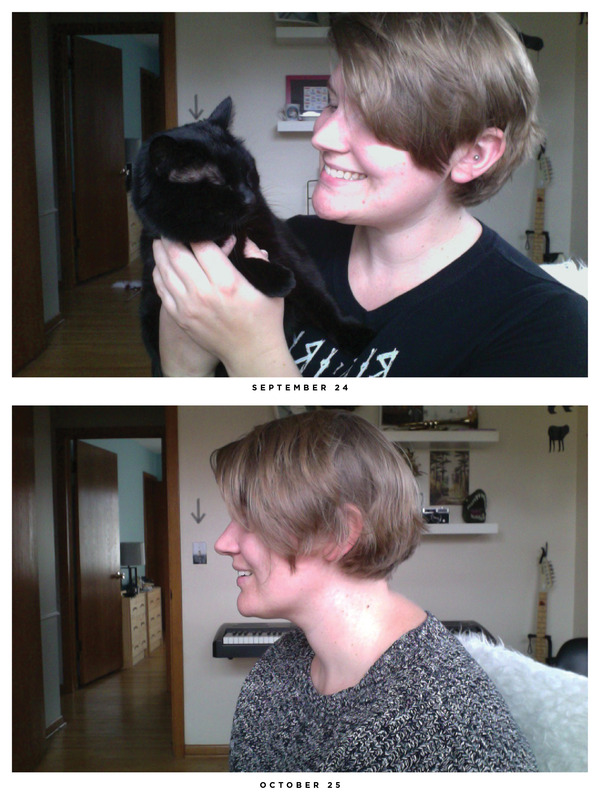 It’s good to know if I ever want to go back to a super short cut, I can survive growing it out again. AND… I’m giving myself a center(ish) part nowadays. It’s all so wild! Making good progress on growing my hair out. Ever so gradually, I have an interesting new look every week or so. Right now I’m extremely digging my length. It’s almost a proper bob now. I feel like it’s classing up my whole look. 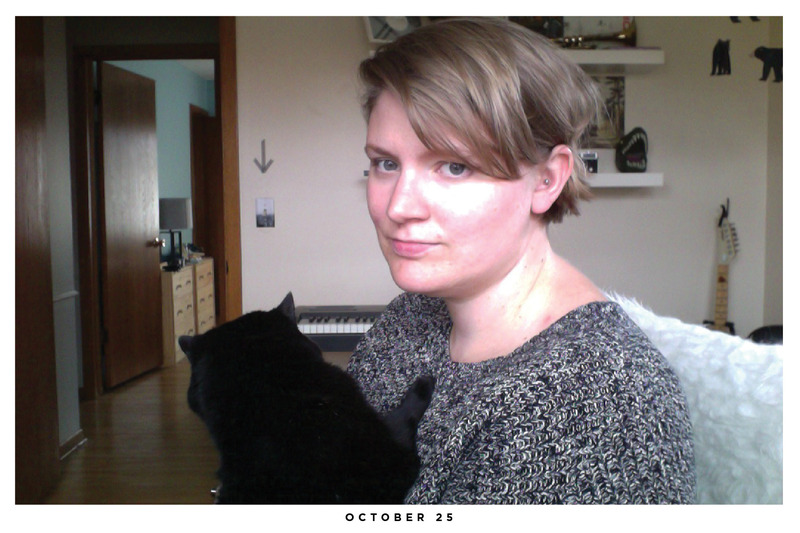 For consistency’s sake, I woke the kitty up from a nap to take this picture. I’m getting haircuts on the reg every 5-6 weeks, so ensure that the bottom doesn’t get too mullet-y (like in September) and eventually matches up with the sides (yeah, who knew! Growing your hair our takes more maintenance than not). A lot of times it feels like a very 90’s bob, like Kelly MacDonald in Trainspotting, which is super cool obv. I do have this thing though where the right side likes to flip out. It did it when my hair was long, which I forgot about. Luckily, the photo booth on my iMac is a living chronicle of my style evolution for almost 10 years. Oh so sassy, 20-year old Caroline. Speaking of hair, I got my very first blowout yesterday. It was brought to my attention on Facebook. The Wow Bar was looking for short hair models. I was like, “yeah,” because it was free and I thought I could blog about it. Oh man. I had so many thoughts during this process. I arrived at the (very chic and fancy) salon with unkempt hair and was offered coffee, which I accepted, even though I’d already had a bunch of coffee and would’ve benefitted from some nice agua fresca instead. Once I became acquainted with my stylist for the day I was given a very nice shampoo in a massage chair and got my tips conditioned, and then a cold rinse. All very fancy. 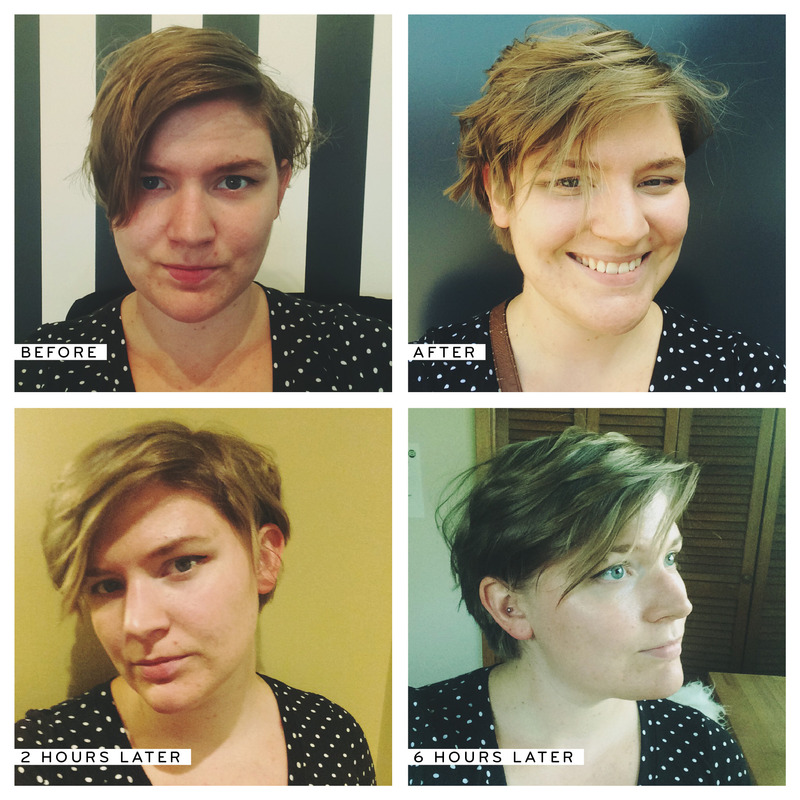 I managed my way through some small talk and had to come clean about not getting my hair done very much. 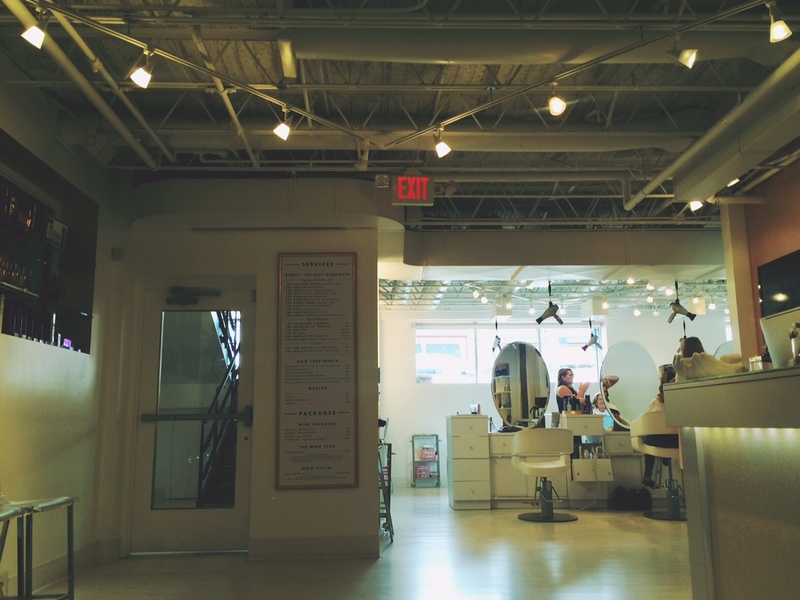 “The last time I went to a salon was before my wedding, last May. Not this last May, but May of last year.” It felt really long ago. She started by asking what kind of thing I wanted. I didn’t really know. I’d never had a blowout before, and I was doing this because they were looking for volunteers. I had not previously planned to get a blowout. If I had to do it again I would’ve known what to say. Something straight and simple, with a little bit of flipped back bangs. Just a little layering and volume, like my girl Michelle Williams back in the day. But I gave my stylist free reign (nearly) and she said we should do some curls. Again, I was totally thinking this would get me the Michelle Williams look. I didn’t know there were that many ways for short hair to be blow dried. For most of this experience in front of the mirror, I was anxious about how it would turn out. My hair was beginning to turn into sort of a halo around my head, which made me very nervous. But in the end, it turned out sort of ok! Much girlier than I ever would’ve asked for, but still cute. Would I do it again? I’m not sure! $35 for a blowout seems like a lot of money for such a basic service (though many women I’m sure would argue that it’s not basic at all! I mean, look at Kate Middleton’s status as hair icon). I wish I would’ve done something like this before my wedding (I did my hair myself) and treated my bridesmaids to it. It lasts one day, and I didn’t really get to show it off because I didn’t have to work long and I went to the doctor. Ha! And while the fluffiness was a major downside in the beginning, as my hair settled throughout the day (and the products seeped in), I was really digging it! One amusing thing that happened during my session was that the stylist (sweetly) asked if “my partner” would take me out tonight for dinner? I had to say that no, we went out last night (ah darn). But I thought it interesting her choice of word and wondered if she wasn’t 100% sure on my sexuality. After all, I had mentioned I was married, but nothing about who I was married to (and I have short hair, ha ha ha). I was amused by her being so PC, but also appreciated it. Also, instead of “where do you live” she asked “where do you dwell?” which I was down with. It’s good to pamper yourself every once and a while. I maybe pamper myself too much lately (in the last week I got my nails done and a massage). If ever I was feeling overweight and bloated, or greasy or had a bad breakout or something… I might treat myself to a blowout, if for nothing else just to get my hair played with for an hour and get a nice shampoo and blow dry. I bet mothers of young children would love this service (as I understand from this Cup of Jo post from a few years ago). I do feel a little prettier and more grown up today. It’d been so long since I’d done *anything* with my hair. It was kind of scary, but made me even more excited about getting to experiment and play with it as it grows out! Have you ever gotten a blowout? Do you want one?